The group spent 31 hours getting from Gill to Doha, Qatar, with the a long layover in Frankfurt! Nevermind, our first day in Qatar was delightful; 78F, a delicious breeze off the Arabian Gulf and blue skies. Our first stop of the day was to the Islamic Cultural Center where we were treated as honored guests and given a personal tour and explanation of Islam by our guide, Adam. 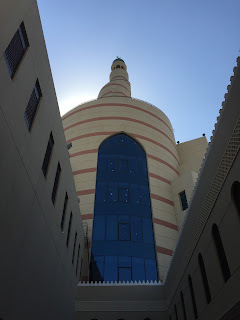 The tour included a visit to the mosque inside the center. After that we made the quick walk to the Souq Waqif market and wandered around this wonderful maze of shops, products and people. A highlight for me was watching the local vendors transport their products around the twisting alleys of the market in wheelbarrows. 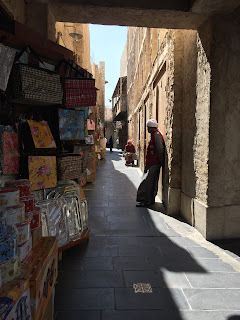 After lunch at a market restaurant we taxied to the Villagio Mall, and there could be no greater contrast of shopping and cultural experiences than the Souq market and the upscale Villagio American style mall; quite the juxtaposition. We then taxied to the Doha waterfront walkway known as the Corniche and took a 20 minute dhow ride at sunset to watch the light go down on the tall buildings of the CBD. Once again there was the contrast of east meets west with the traditional style of the dhow contrasting with the western pop music the dhow skipper was blasting from his boat speakers. I'm not trying to be judgmental by noting that one of our boys asked the boat captain to turn the volume down. We finished our day by walking to the Souq and dining at an excellent Lebanese restaurant, the Zaatar wa Zeit. There were many more people at the Souq at night, and this was a fascinating people watching experience for me. We returned, tired but joyful, after a wonderful day exploring a contrast of sights and experiences that is Doha. On Wednesday, we visit the Islamic Art Museum near the Souq, and this afternoon we travel to the desert to spend the night in tents (we hope). Cheers from us all.